It has been established that shoes aren't necessary for babies yet and may even be harmful to their growing feet. But allowing them to go out barefoot seems a little awkward... and it can be really cold in malls or outside at night. Well... you can buy your baby some really cute Funky Feet Not-Quite Sneakers, Loafers, Flats or Mary Janes. 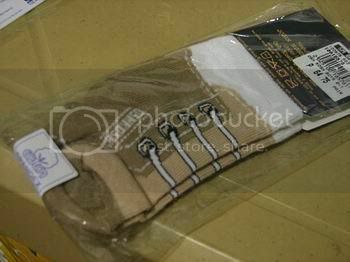 Or you can head to the nearest Robinson's or SM Department Store and look for Burlington socks with shoe designs. These socks can fit 0-2 years old (compared to Funky Feet's 0-12 months) which I liked because my son's feet are big and fat. And they only cost around P70.00 per pair. Unfortunately though, there was only one design available for boys (red sneakers... Funky Feet's looks better, at least in pictures, because it really makes you think of Converse shoes). But Burlington offers many choices (most in pink) for girls. Even bright yellow socks with black Mary Janes. Of course, once your baby starts toddling, he will really need soft shoes to protect his feet.